On October 2, 2008, “Solar Day”, the whole school celebrated the installation of 53 solar panels on the roof of the middle school. The Progressive School of Long Island promotes social and moral responsibility in its students’ minds and hearts. This is a cornerstone of Progressive education, as is nurturing students’ curiosity, learning by doing, and instilling a respect for every living creature on the planet, as well as the planet itself. At this K-8 private school, middle school students devote an entire period to student volunteering. The elementary school is also heavily focused on doing for others. Many communities have benefited from the school through their volunteer programs. Director Eric Jacobson feels that the student-run volunteer activities help the local and global community, but they also help engender a limitless sense of empowerment. Students feel that they can overcome any obstacle that they recognize in society, with solid planning and facilitation from instructors. This sense of empowerment carries over into academics; it is not unusual for students to study one or two grade levels ahead at PSOLI. One of the most consistent areas where students focus their volunteer time is on the environment. Grade school students ensure efficient, school-wide recycling and design numerous programs, including a sixth grade carnival to save the wild-cats. Environmentally aware “stu-vol’ projects have included selling eco-friendly reusable supermarket bags, volunteering at animal shelters, as well as protecting other endangered species. The intensity with which students regard the environment was heavily reflected in the student run newspaper, The Progressive Post, and its news broadcasts. With so much school-wide energy focused on the environment, it is fitting that the school focused on their own use of consumable energy. Mr. Jacobson felt that the installation of solar panels would align with the school’s sense of environmental responsibility. After considerable fund-raising spearheaded a parent and her three children (who organized theme parties to raise funds), the school installed the panels during the latter part of the summer. Critical to making the project possible was the generosity of K-Star Solar, a solar installation company, which provided one hundred percent free labor as well as providing a monitor for the science room, which records scientific data about the amount of electricity generated and the green house gases avoided by installing the solar panels. Gencorelli and Salo also donated one hundred percent of their time for their architectural services provided. 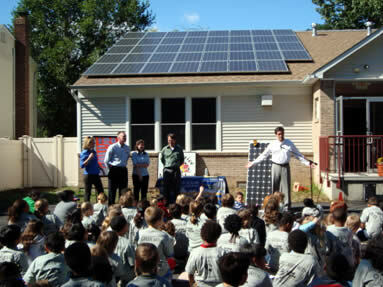 The Long Island Power Authority (LIPA) provided a generous rebate for the installation of the panels.